For many singles, they are completely content being on their own. They love making their own decisions and dating and flirting with whomever crosses their path. However, when Valentine’s Day approaches, these feelings of goodwill towards couples and feelings of happiness towards their singledom are quickly wiped away. They find themselves shaking their fists at smooching couples and wiping out candy aisles “by accident.” If this sounds like you, don’t be ashamed or hostile. 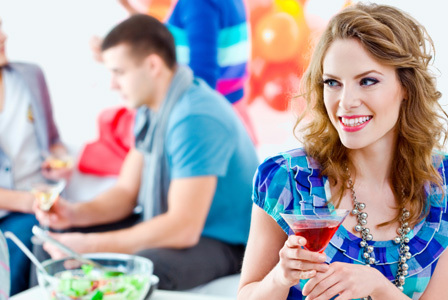 Host an anti-Valentine’s Day party instead with your single friends and drink and eat, celebrating your freedom. Don’t spend another Valentine’s Day wallowing or eating pints of Ben and Jerry’s. Instead, throw a fabulous party for all of your fabulous single friends and celebrate! How can you not have fun eating decadent mac n cheese and sipping fizzy Champagne cocktails? For added fun, create anti-Valentines to pass out to your party guests as favors! What better way to celebrate being single than to serve and indulge in single serve portions of your favorite food? 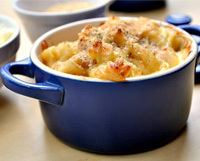 Serve these macs in adorable mini- cocottes for a cute, delicious meal you won’t have to share! Watch out though — earthy, creamy, decadent flavors of this mac n cheese will have you craving more! For the ingredients and preparation, check out this recipe! 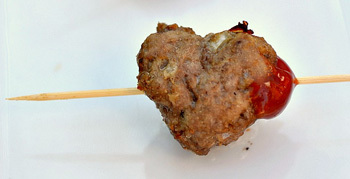 Nothing says “I’m single and I’m happy!” like a heart-shaped meatball on a stick. Well, not quite. But these delicious lamb meatballs are the perfect appetizer to a singles only party. Shaped like hearts and then slid on a skewer, these flavorful meatballs are filled with Italian flavors and fresh, pungent ingredients, like garlic cloves and sweet yellow onion. Beef and turkey are good substitutes as well. Grease baking dishes with nonstick cooking spray and set aside. Using your hands, mix meat, breadcrumbs, parsley, Italian seasoning, egg, onion, garlic, Worcestershire sauce and salt and pepper until fully combined. If meat is too sticky, add additional breadcrumbs. Cover with foil and chill for at least an hour. Preheat oven to 400 degrees F. Once meat has chilled, remove from fridge. Using your hands and a mini heart-shaped cookie cutter, make about 28 heart-shaped meatballs. Place in dishes and bake for at least 25 – 30 minutes, or until meat is fully cooked and browned. Serve on a skewer with a dab of ketchup! These sliders are the perfect bite-sized snack for the single and happy. These sliders require no commitment of any kind — no knives or forks, plates, napkins or spoons, no extra baggage at all. Just two bites to blissful, creamy avocado and zesty, fresh, delicious crab cake. The key to an amazing slider? A toasted bun and fresh crab meat! 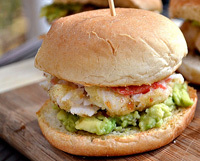 Check out the crab cake recipe for these delicious sliders here. Whether you are happy to be single or secretly wishing for a mate, nothing will keep your happiness going or perk you up quite like vodka soaked fruit. Or vegetables. Really, anything soaked in vodka is sure to keep the party hopping. 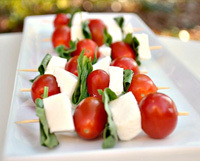 These delicious caprese skewers have a great bite from the pepper vodka that is instantly soothed by fresh mozzarella and basil. Check out the recipe for these incredible skewers here! Some people are single out of choice and some are single because they’ve just had their heart broken. 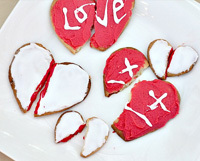 If you are one of the lonely ladies whose heart was just shattered into pieces by an evil ex, these broken heart cookies are right up your alley. Each sinfully delicious and shattered sugar cookie is not only symbolic of your own broken heart, but is sweet, delicious and low in fat! Made with half the butter of regular cookies, these will mend your bleeding heart and keep you skinny at the same time. For the sugar cookie and frosting recipe, visit here. To make these, simply cut out hearts with heart cookie cutters, bake for eight minutes and then break in half and frost! 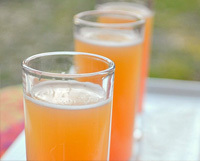 Even the name sounds relaxing for these chuggable shooters. These pink, coconut flavored shots are the perfect way to put your mind, your broken heart and your loneliness at ease. Each delicious shooter is filled with delicious coconut flavor, a zest from the orange juice and just the right amount of sweetness from the maraschino cherry juice. After a few of these tasty yet strong drinks, you’ll have forgotten it’s Valentine’s Day anyway. And probably your name and address too. For the recipe and how to make them, go here! Everyone may think it’s cute that a fat, winged cherub shoots people into the heart cavities with arrows, but some people also find it a bit violent and off putting. If you are one of those people, drink a cocktail made of cupid’s blood. Well, not that graphic — it’s quite simple but looks deliciously gory and tastes absolutely refreshing. There’s a good chance that in real life, cupid’s blood is fizzy wine with a bit of food coloring. 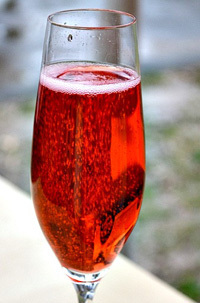 Pour enough sparkling wine to fill Champagne flutes, about 3/4 full. Add at least five drops of food coloring to each glass to get a deep red color. Cheers and enjoy! Who said you had to be in love or a relationship to enjoy Valentine’s Day?